Joanne George tears up recounting stories she’s heard about how her dog Smiley, a blind therapy animal with an indomitable spirit, has changed people’s lives. One woman told George that she’d been lying in bed contemplating suicide. Then she picked up her phone and saw Smiley’s photos on social media. “She said she just started skimming through the pictures and she said, ‘I have a tiny smile. The next thing I know, I was laughing,'” George, 45, told TODAY. 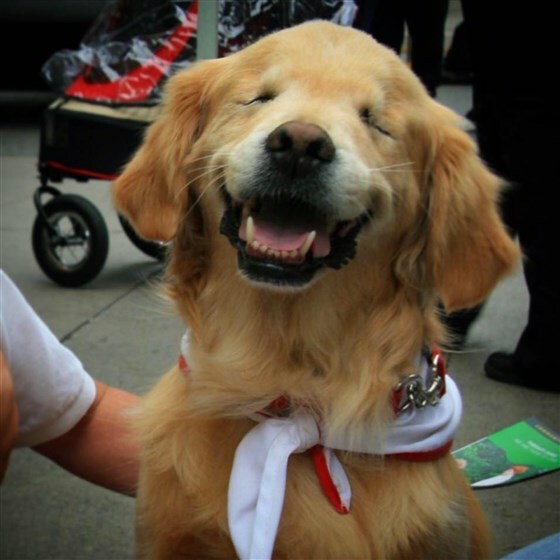 Smiley, who was born blind and into a horrific environment, lived the sort of life that inspires magical stories. He died in October after a short but devastating bout with cancer. George is doing all she can now to keep his beautiful legacy alive. 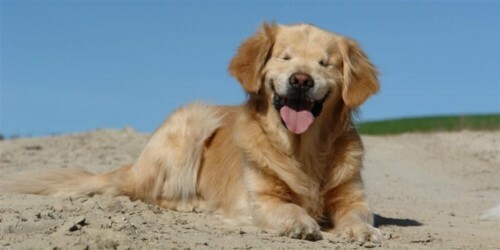 In 2004, Smiley was rescued from a Canadian puppy mill, where he was born without eyes, along with a form of dwarfism. George was a veterinary technician who went to the puppy mill in order to euthanize Smiley and some 20 others of the 80-plus dogs living there. Instead of ending their lives, though, George and the other vet techs decided to help the dogs find new homes. All the other dogs were quickly adopted except for Smiley, whom George fostered at her home in Stouffville, Ontario. As time went on, George realized he belonged with her. Once he got accustomed to life as a pet, Smiley’s beautiful personality bloomed — along with his ability to help others. George decided to have him trained and certified as a therapy dog. He made people feel better when he met them in person, and also helped those he just “met” online; his social media pages attracted hundreds of thousands of deeply engaged followers. She had another idea as well. She raised funds to commission a statue of Smiley from the Utah-based artist Lena Toritch. When finished, the statue will be placed in a courtyard at the Whitchurch-Stouffville Public Library, where Smiley was a regular. Kids often sat with him there, and read. Last week, George and her 8-year-old son, Shepherd, traveled to Utah to see the work in progress. 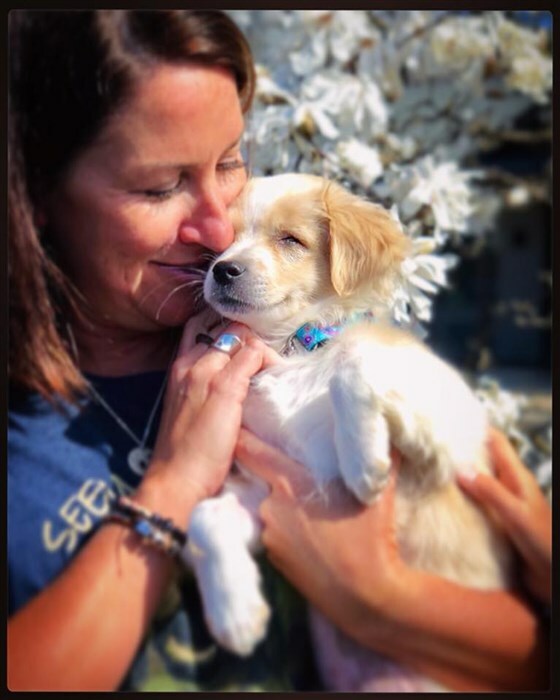 But first, they made a stop in Eugene, Oregon, to pick up a 12-week-old puppy named Sunny from his foster home. Like Smiley, Sunny was also born blind and in a rough situation. Sunny was taken in by the nonprofit Northwest Dog Project, and five weeks ago went into foster care with Candice Miller, a pit bull advocate who has a famous pack of dogs of her own. When George expressed interest in adopting the pup, it seemed like the ideal fit. “She had an amazing amount of experience to be able to care properly for Sunny and … he would have a pretty incredible life with her. I thought he was a very lucky little boy,” Miller said. “Once we brought him inside and he met Shepherd, I could tell they were going to make an incredible match and family,” she said. Then George, Shepherd and Sunny flew to Utah to see Smiley’s statue for the first time. Creating the work has been “a moving experience” for Toritch. 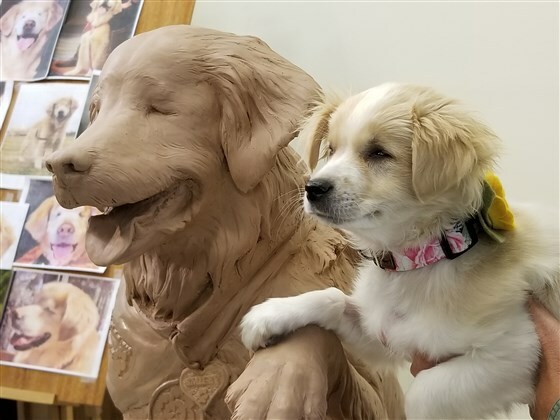 She hopes the statute, which will be cast in bronze in the coming months, will continue to deliver the message she feels this dog so embodies. Having Sunny and Shepherd there with her helped George get through the emotional experience. And while she didn’t get to see Smiley as a puppy, she thinks he would have looked a lot like Sunny. She thinks Sunny will make an excellent therapy dog, too.